Below are previous events sponsored/hosted by the Center for Student Professional Development. Click the links below for photos and information about past events. The Center for Student Professional Development (CSPD) welcomed GSU Alum, Brian E. Lowe, (a.k.a. “B. Lowe”). Brian, a former athlete at Grambling, is the Founder and Managing Director of “TeamUp Sports” Consulting. B. Lowe continued his enthusiastic engagements by sharing with students why it is important to be very purposeful in developing and managing your brand. 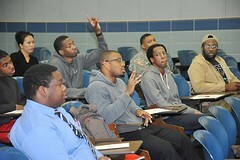 He also encouraged students to start “networking”. Enhancing your networking skills could start with getting to know your professors and their respective networks. F. Lawrence Coleman brought a dynamic mix of expertise and career perspectives from his experience as an executive and entrepreneur. Experienced in identifying and developing interviewing competencies, he has provided his expertise and guidance as a mentor on career preparedness and development to job seekers for over 10 years. Mr. Coleman inspired students to reach their full potential and create their own “WOW” moments during interviews and other professional settings. The students discussed various interview scenarios and challenges and how to excel in these situations. Following Mr. Coleman’s informative presentation on “Effective Interviewing Skills”, he conducted “Mock Interviews” with students, both undergraduate and graduate. Executives from CenturyLink in Monroe visited COB classes, as well as held a panel discussion in Grambling Hall to discuss Project Management career options, various types of project management certifications, and the possibility of establishing a Project Management Institute student chapter at GSU. CenturyLink is a multi-national technology services company headquartered in Monroe, Louisiana. CenturyLink offers a broad range of services and products such as telephony, big data and analysis, cybersecurity and cloud computing. Our guests from CenturyLink shared experiences with their careers, comments about career management and professional development. Among the group of CenturyLink executives was GSU College of Business alumna, Ms. Tamika Cherry. Thank you, CenturyLink and Ms. Cherry for your commitment to the students of Grambling State University. Computer Science Corporation (CSC) representative, Geoffrey Lucas, spoke with Grambling State University College of Business majors during an informational session about CSC business structure and service offers, employment opportunities, and keys to a successful job search and professional career. CSC is a global leader of next-generation information technology services and solutions, such as big data and analytics and cyber-security. Mr. Lucas explained that making a good first impression was very important when looking for a job. He also emphasized that students should not engage recruiters in groups. It’s best to approach recruiters alone, so the student can get quality one-on-one time. Mr. Lucas encouraged students to apply for internships and employment with CSC. He stated that CSC partners with universities such as Grambling, to ensure that students are technically and professionally ready for the global IT job market. Students were given the opportunity to engage with Mr. Lucas one-on-one and in small group discussions. Thank you to Mr. Lucas and Computer Science Corporation.